Charles Frederick followed his father’s trade. In 1901 he was living in Cambridge St, Grantham but by 1911 he was a joiner/carpenter on the Belton estate and living with his widowed mother in the village. In 1912 he married Cicely Henrietta Hill in Battersea. 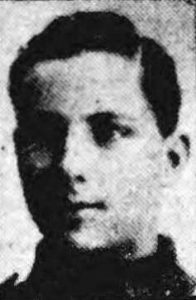 Charles joined 6th Battalion, Lincolnshire Regiment on 31st Aug 1914. 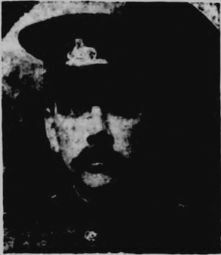 The battalion trained in Grantham and he was promoted to L/Cpl. On 1 Jul 1915 they sailed from Liverpool to Alexandria. Then via Mudros to Cape Helles on the Gallipoli peninsula. After 11 days ashore they were withdrawn for a landing further up the coast at Suvla Bay on the night of 6/7th August. On the afternoon of 7th they captured Chocolate Hill at Yilghin Bumu in a bayonet charge. L/Cpl Charles Saxelby died in this action, but has no known grave. He is commemorated on the Helles Memorial. Cicely (his widow) originally came from Denton, where her father Uriah Wright, was the publican and a colourful character. Her first marriage was to George T Hill, with whom she had a daughter, Jessie in 1899. They lived in Denton, although they may have later moved to Belton, as George was also a joiner. George died in Jan 1911 and Cicely married Charles Saxelby the following year. She was around 10 years older than Charles. Although Jessie’s address was given, in 1915 Cicely was living at Grammar School House, Wakefield (Charles’ uncle had moved to Wakefield). She didn’t remarry and died in the York area in 1954. Jessie did well at school, initially in Denton and then at Kesteven Girls School in Grantham. In 1911 she was boarding with a family on Manthorpe Road. In 1915 she was living in Belton and qualified as a pupil teacher. She left school in 1917 and spent two years at Leeds Training College. In 1919, when she qualified as a teacher, her address was still Belton. John Henry became a railway clerk. He may have moved to Derby. Walter was 6ft 2.5” tall. He also became a railway clerk and in 1911 he was living in New Barnet (North London). In Jun 1913 he emigrated to Canada on ‘The Corsican’. 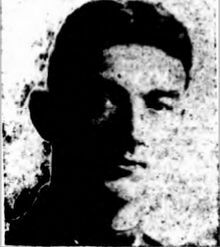 In October 1914 he joined the Canadian Army and the following June he came to England with 28th (North West) Battalion, Canadian Infantry. Walter was promoted to Lance Corporal. After completing their training at Shorncliffe (Kent) the battalion sailed to France in Sep 1915 and was sent to the front line near Kemmel, south of Ypres. On 8th Oct 1915 the Germans set off two mines under the Battalion’s trenches, followed by heavy artillery and rifle fire. The explosion resulted in 19 killed, 30 wounded and 7 missing. Walter Saxelby was amongst those reported missing, but was later confirmed as killed. He was buried in Kemmel Chateau Military Cemetery. Charles Abraham became a joiner/carpenter. He married Fanny Story in Swinstead in 1885 and they lived in Syston. Fanny died aged 37 in 1896 leaving him with 5 children. Charles Abraham was a carpenter on an estate, probably Syston Hall. One day in 1897 Charles was fetched by the housekeeper to Syston Lodge. Mr and Mrs Bonnett were the lodge keepers and Sarah Bonnett (82) who was nearly blind, was badly burnt when her apron caught fire. The housekeeper, Miss Beeson was burnt trying to put the fire out. Mrs Bonnetts clothes were still smouldering when Charles arrived. Sarah Bonnett died the next day. Arthur Hardy was working at Grantham Post Office in 1901. Alfred worked as a railway porter before he joined the Navy as a stoker in 1907. 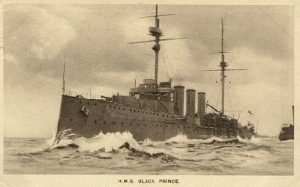 His first posting was the training ship HMS Nelson, he then served on a number of ships before deserting from HMS Black Prince in Nov 1915 and disappearing. He seems to have had a lucky escape; the Black Prince was lost with all hands at Jutland 6 months later. Walter was working as a pantry boy at Syston Hall in 1915. When he was 18 he joined the Lincolnshire Regiment. 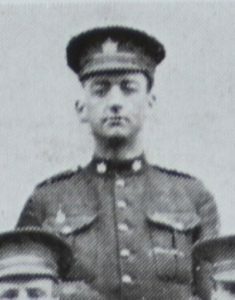 After 12 months training in Grimsby he spent 3 months in Ireland before going to France to join 1st Battalion. On 30th March he was seriously wounded in the neck and shoulder, probably in the Somme area. He died in hospital 4 days later and was buried in Etaples Military Cemetery.